Instant Frozen Yogurt was posted on January 19th, 2012 and is filed under Desserts, Gluten Free, Low Carb, Protein, Recipes, Snacks. This entry has 23 comments. You can follow any responses through the RSS 2.0 Comment Feed. Frozen yogurt, how I love you! Let me count the ways. Seriously, I’m such a creamy dessert kind of gal. I’m not crazy about cake or cookies (exception: chocolate kinds). I’m all about the mousse, pudding, ice-cream, whipped topping, rice pudding, and frozen yogurt!Especially frozen yogurt. The store bought stuff tastes amazing, not gonna lie, but I don’t like all the extra stuff in it that makes it just as unhealthy as store bought ice-cream. Artificial flavourings, preservatives, high-fructose glucose…those don’t sound nice at all. I typically try to avoid carbs in the evening, as well as sugar, so I’ve come up with lots of simple dessert ideas to nip that sweet tooth in the bud! This is my favourite quick recipe! It’s so simple; it really shouldn’t even be called a recipe. It’s also great for a healthy sweet snack or for recovery after a tough workout. I really love to use Greek yogurt to up the protein! 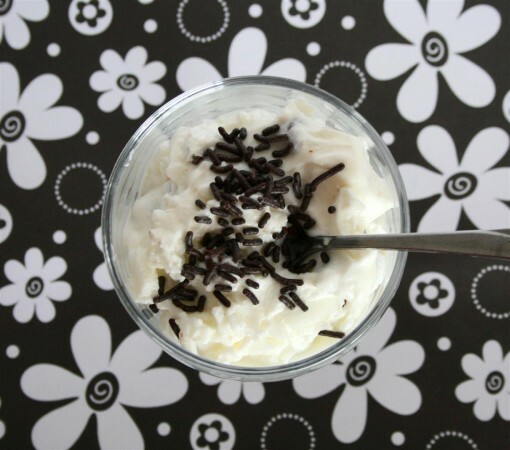 *I often use a thick-style of Balkan yogurt if we don’t have Greek. **I used NuStevia as well, but only up to ¾ of one packet…it’s a LOT sweeter! Just put the ingredients in a bowl and stir. Add just enough Truvia until it’s as sweet as you like it. Now pop it into your freezer for maybe a half of an hour (ish) and just give it one or two stirs when you pass by the freezer. Once you take it out, it should have an ice-cream consistency. Serves 1. Want a bite? You know you do! *This totally varies depending on what Greek yogurt you use. The kind I like using has over 10g of protein per serving! So, just for fun, here they are! 1. I don’t mind seeing it, but I hate it when people talk about blood or needles. I’m not squeamish, but this sort of does something to me! 2. 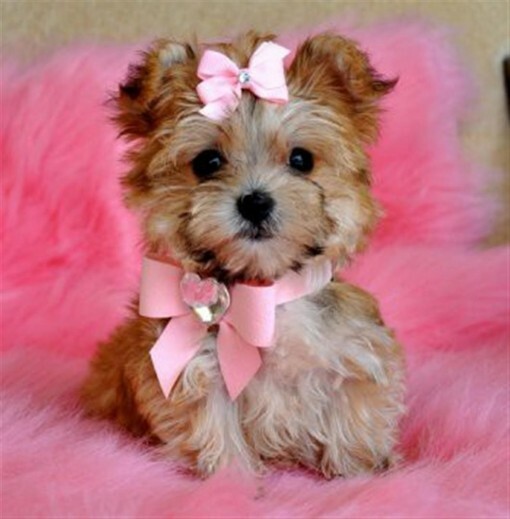 I want one of those tiny, teacup type dogs. Yes, they are completely useless, but I think they are adorable! Isn’t it adorable? Found him (pardon me…her) via Pinterest and totally flipped! This one kinda pulled at my heartstrings too! 3. Change is something I’m not afraid of. I adapt pretty easily to new things. 4. I am Christian and the Lord Jesus gives me fulfillment and a joy-filled existence. I truly couldn’t ask for a better life! I’d love to hear 5 things about you too! Simply comment below…I love reading your comments! You all make my day every day! Do you like frozen yogurt or ice-cream better? I love this idea. I need to get some stevia to add. I always want ice cream at night… SIGH. That puppy!!! I am such a sucker for pups…I have two! If I wasn’t lactose I would definitely be trying that ice cream! That looks absolutely delicious! I love froyo as well. I’ve never made homemade before. I guess I should try it out! Fro-yo is my absolute favorite! I may have to try that recipe. I’m also a believer. Nice to know that you are too. I actually prefer creamy desserts, too. That’s a cool idea (literally). I wonder if it would work with the coconut-based Greek-style yogurt (http://www.turtlemountain.com/products/product.php?p=so_delicious_yogurt_cm_gk_plain). I think the teacup pup is adorable. I also love that inspiring pic you found on Pinterest. Love this! Looks SO tasty!! one thing about me : I LOVE fro yo SO much!!! I never thought of making frozen yogurt this way, but it makes sense! I do the same thing with fruit puree and a sweetener–makes a great, fresh tasting sorbet. Yum! Looks great :o) I just stumbled upon your sight and will have to follow. You have a lot of great, helpful posts. oh how i HEART froyo!! yum!!!! I will definitely try this! I do have a question, though. I’ve only seen Truvia in here in Canada once and never since so I was wondering if instead of that, Splenda could be used? And if so, how much? Coral~ So glad you visited! I’m glad you found me! Wendy~ Yes, we buy our Truvia in the states, but you can order it on Amazon for a good price too. However for substituting, I don’t recommend Splenda because it’s an artificial sweetener. I think organic sugar would be a better call. You could also try xytiol, coconut sugar, (which is found in health food stores), or maple sugar. However…liquid sweeteners like honey, maple syrup, or agave nectar can work too! :) Hope that helps! Wow, what an amazing trick! I love Greek yogurt and frozen yogurt, but this never even crossed my mind. I can’t wait to try it out! Can I substitute the greek yogurt for REGULAR plain yogurt??? I live in brazil and we dont have anyyyy!